Searching for truly Paleo coconut milk that contains just coconut and water, without gums, additives or preservatives? Like the Trader Joes Lite coconut milk but with they had an organic and creamy coconut milk offering? Trader Joes just added a full fat organic paleo coconut milk no guar gum offering to their product line! 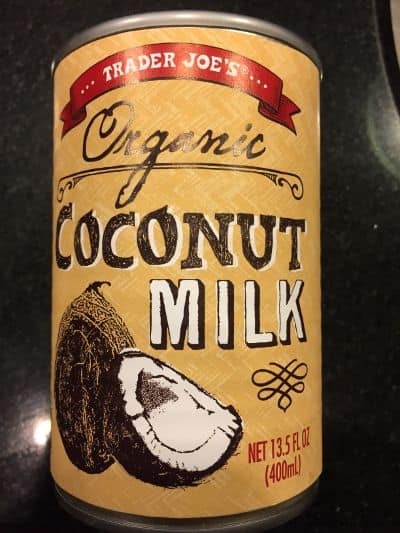 In this post I go through the various coconut milk products available at Trader Joes, to highlight which ones come the closest to pulling a fresh coconut off the tree (always a good rule of thumb on Whole30, Paleo and even Keto). Coconut milk without a lot of additives, preservatives and general junk can actually be one of the more difficult ingredients to locate. Is Trader Joe’s coconut milk Whole30 compliant? The three canned organic coconut milks at Trader Joe’s are all Whole30 compliant. The only ingredients in all three (tan, pink and blue cans) are organic coconut and water. The cartons of unsweetened coconut milk beverage are technically allowed but are less ideal due to the gums and additives used. Trader Joe’s has several different coconut milk products placed in different areas of the store. Some are great options for the Whole30 and others are not. We’ll attempt to go through each of their coconut milk products so that you can see the differences and make sure you are getting the right one. Trader Joe’s Coconut Milk on Whole30 – Which is Better? Let’s run through the coconut milks you might encounter in a typical Trader Joe’s shopping trip. For each one, we assess whether it’s a good option on a Whole30. Is Trader Joe’s Canned Organic Coconut Milk ok for Whole30? This is one of the coconut milks highly recommended for Whole30. The only ingredients are coconut and water, you can’t get much healthier than that in terms of coconut milk. I have heard some complaints about the consistency. Due to it not having gums or stabilizers, the coconut and water can naturally separate, especially in colder temperatures. One solution is to give the can some good shaking to mix it up before opening (I would say a good tradeoff versus having to use additives for consistency). Is Trader Joe’s Organic Reduced Fat Coconut Milk ok for Whole30? This canned coconut milk is also an excellent choice for a Whole30. Choose this one to add to soups, smoothies or other applications that call for a thinner consistency than the regular coconut milk, or for those attempting to keep calories down. The reality is you are essentially paying less but also getting less coconut and more water per can than the regular version of the Trader Joe’s coconut milk above. However, this can sometimes make sense. Coconut milk goes bad pretty quickly after you open a can, so although you could mix more water with the regular TJs organic coconut milk and get something very similar, unless you need multiple cans worth of coconut milk in the next couple of days, buying the reduced fat (reduced coconut) can might make more sense. Ingredients: organic coconut base (water, organic coconut cream), calcium phosphate, magnesium phosphate, guar gum, xanthan gum, vitamin a acetate, vitamin d2, l-selenomethionine (selenium), zinc oxide, folic acid, vitamin b12. Is Trader Joe’s Coconut Beverage (unsweetened & non-refrigerated) ok for Whole30? According to the Whole30 moderators, all the ingredients in this coconut beverage from Trader Joe’s are actually allowed on Whole30. That said, they also mentioned that there are likely better coconut milks out there with less ingredients and likely a better source of coconut than the organic coconut base used in this one. This coconut milk has a whole lot more gums and fortified vitamins than the canned Trader Joe’s coconut milks. Is the refrigerated Trader Joe’s Non-Dairy Coconut Beverage Unsweetened ok for Whole? Even though this unsweetened coconut milk is in the refrigerated case, its the same ingredients as the carton shelf stable unsweetened coconut beverage above – both are allowed on Whole30 although they are not the best choices. Is the Trader Joe’s Vanilla Non-Dairy Coconut Beverage ok on Whole30? Given that the vanilla version of the Trader Joe’s Non-Dairy Coconut Beverage includes Cane Syrup which is a form of sugar, it is absolutely not allowed on the Whole30. Is Trader Joe’s Coconut Creamer Whole30 compliant? Unfortunately, the refrigerated Trader Joe’s Coconut Creamer is not Whole30 compliant, but there are other coconut creamer options at Trader Joe’s that are! There are actually several Trader Joe’s coconut creamer products available, although most people are likely thinking of their refrigerated non-dairy coconut creamer. Is Trader Joe’s Canned Organic Coconut Cream ok on Whole30? The Trader Joes canned coconut cream is a great option as a Whole30 compliant creamer. The only ingredients are coconut and water, so no hidden ingredients like many coconut creams and non-dairy creamers. It is essentially identical to the popular Trader Joe’s canned coconut milks just with a higher ratio of organic coconut to water. Ingredients: organic coconut milk (water, organic coconut cream), dried cane syrup, dipotassium phosphate, titanium dioxide (for color), xanthan gum. Is Trader Joe’s Original Coconut Creamer Non-Dairy ok on Whole30? The Trader Joe’s Original Coconut Creamer is not compliant with the Whole30 guidelines. It contains cane syrup, a form of refined sugar, which is definitely not allowed on Whole30. 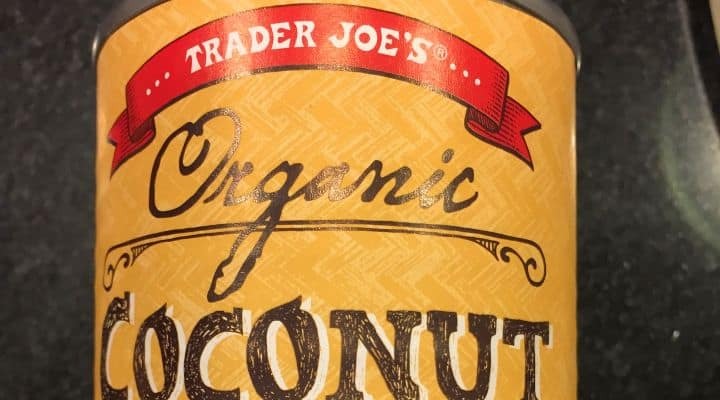 Is Trader Joe’s Coconut beverage the same as coconut milk? With Trader Joe’s products, there is not a clear distinction between their coconut milks, coconut milk beverages and coconut beverages – I would describe them all under the category of coconut milks (although the coconut beverages tend to have a lot more additives/fillers). As you can see from the ingredients in the above section, there are striking similarities between some of the Trader Joe’s coconut beverage products and the Trader Joe’s coconut milks, especially between their shelf-stable tetra pack unsweetened coconut milk beverage and their refrigerated unsweetened coconut beverage (which appear to have identical ingredients). Although this may not be the case for many coconut milk beverages, Trader Joe’s coconut beverage products are relatively close to traditional coconut milk. However, their coconut beverage products have all the ingredients I would typically look to avoid in coconut milk, such as gums, fortified vitamins and in some cases, refined sugar. That said, I would guess that coconut beverages from other companies may be even further from real coconut milk. The bottom line is that although I would definitely recommend the Trader Joe’s canned coconut milks over the Trader Joe’s coconut beverages, there is not a clear line between what they consider a coconut milk and what they consider a coconut beverage. Are Trader Joe’s coconut milk cans BPA free? All Trader Joe’s coconut milk cans are BPA free according to the their FAQ on BPA. BPA is a common concern about using canned products, so I wanted to make sure to mention this. If there was BPA in their canned coconut milk, that would be a reasonable reason to opt for their coconut milks/beverages in a carton. Because all the Trader Joe’s canned coconut milks and creams come in BPA free cans, that eliminates that factor in choosing canned versus refrigerated coconut milk. Given that the ingredients in the TJs canned coconut milk are so much better (100% coconut version coconut mixed with gums) I would argue there is very little reason to choose anything but their canned coconut milks. What kind of coconut milk is Whole30? Coconut milk is allowed on Whole30 if it is made with traditional ingredients: coconut and water and as long as it does not contain additional ingredients not allowed on the Whole30 such as refined sugars, sulfites, and carrageenan. Some examples are TJs canned coconut milk and Natural Value. Is Trader Joe’s coconut milk keto friendly? The unsweetened Trader Joe’s coconut milks are extremely keto friendly, having only a bit of natural sugar. These include all three of the TJs canned organic coconut milk (original, reduced fat and coconut cream) as well as their refrigerated and shelf stable unsweetened coconut milk/beverages. Is Trader Joe’s coconut milk SCD legal? Some Trader Joe’s coconut milk products are SCD legal. Their organic canned coconut milk: original, reduced fat and coconut cream are all SCD legal. The only ingredients in all three are organic coconut and water. Trader Joe’s coconut beverage products are not SCD legal. They contain gums.